Got an overage of blueberries this season? 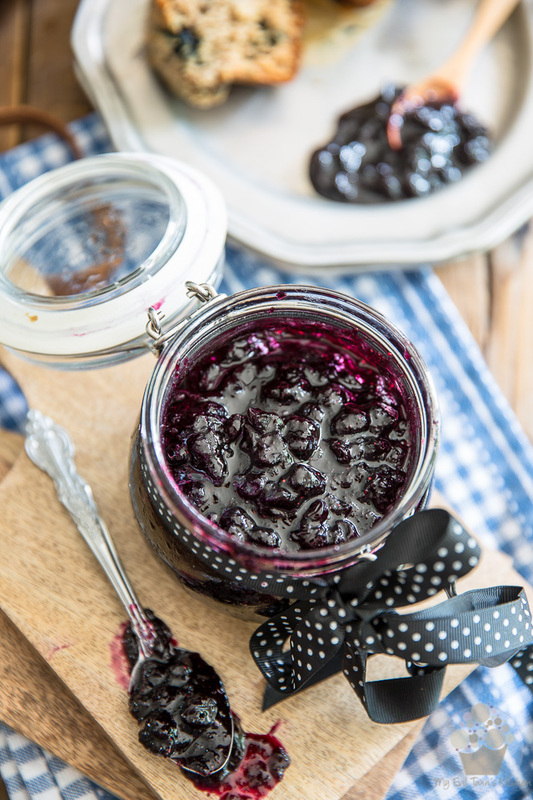 Why not make a batch of this Quick Blueberry Jam? 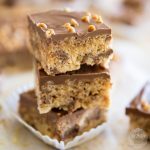 It’s probably the easiest and most delicious way to use them! My baby grand-daughter, she has this MAJOR thing for blueberries. And really, when I say major, I do mean MAJOR! I’ve never seen anyone love anything THAT much before. She’s not even 2 years old yet, so she’s still this tiny little thing that [supposedly] eats very little, you know. But, I’m telling you: you sit her down with a full pint of blueberries (thinking she’ll eat a few and then hand over the rest when she’s had enough) and she’ll totally wolf the whole thing down before you’ve even had time to realize what happened. True story! I recently was lucky enough to have her (and mommy and daddy, too) spend an entire week at my place, and as luck would have it, blueberry season was in full swing when she visited. So I bought CASES of the little blue gems, mainly for her, you know. She ate a great deal of them, but still… I may have gotten a little bit carried away, because by the time she returned home (sadly, all good things must come to an end) I was stuck with a great big blueberry overage. Even after I made my Lemon Blueberry Bundt Cake, I still had close to half a case left in the fridge! By the time I got down to the final 3 pints, I was faced with blueberries that were sill very edible in their fresh state, but that had also lost a little bit of their former glory. 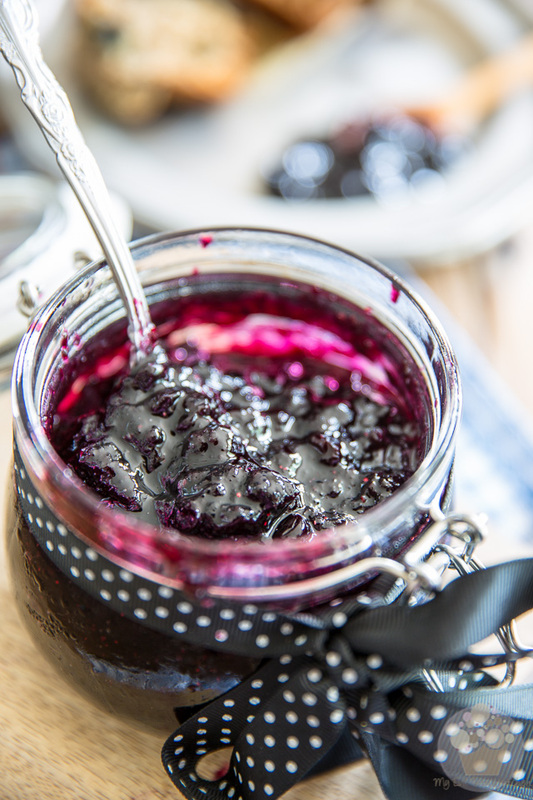 So I thought what better way to use (and honor) them than by whipping up a batch of Quick Blueberry Jam? But now that I made the jam, I’m wanting to use it in all kinds of delicious recipes. In fact, I’m so inspired, I totally wish I’d made more… but unfortunately, this is all I have, and blueberry season is now a thing of the past. This means I’m gonna have to decide which ONE of my inspirations will get to materialize. I’ve narrowed it down to [a toss between] White Chocolate Blueberry Cupcakes, Individual Blueberry Cheesecakes or a No Churn Blueberry Swirl Ice Cream. What do I do, how do I decide? Flip a coin? Is there such a thing as a 3 sided coin? Or perhaps, I could go with the 4th “none of the above” option and eat the whole batch by the spoonful. It’s so good, I almost wouldn’t mind that! Seriously. This is almost like eating blueberry pie filling out of a jar. YUM! But the evil baker in me, she DEMANDS that I put this delectable concoction to a better use. Ugh. Which recipe would you choose to make if you were me? Or, which one would you like to see me make so that you can try it after? Honestly, this jam is so easy to make, I didn’t even need to add my usual step-by-step instructions. But, I still wanted you to get an idea of what to expect and what the various stages looked like so I did. But I’m pretty sure that this beauty, it’ll keep in the fridge for MUCH longer than it’ll take you to eat it, or use it all up. 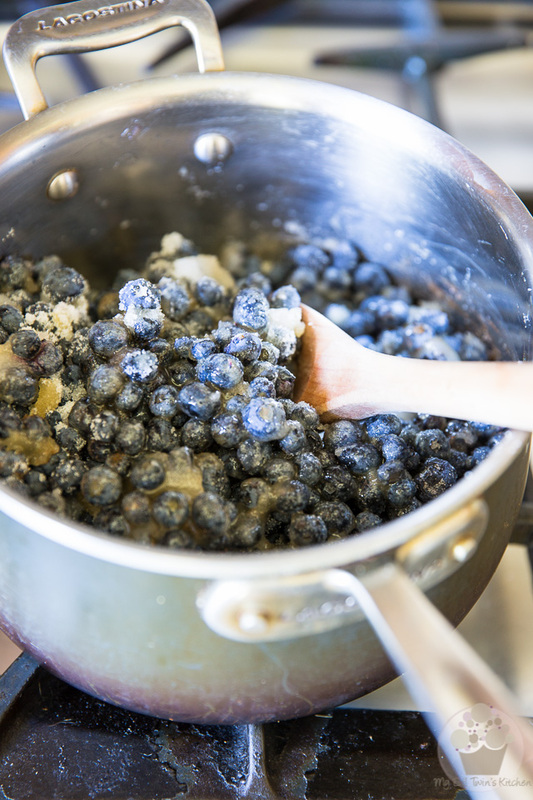 First, combine the blueberries, sugar, maple syrup (or honey), lemon juice, vanilla and lemon extracts, salt and cinnamon in a large saucepan. 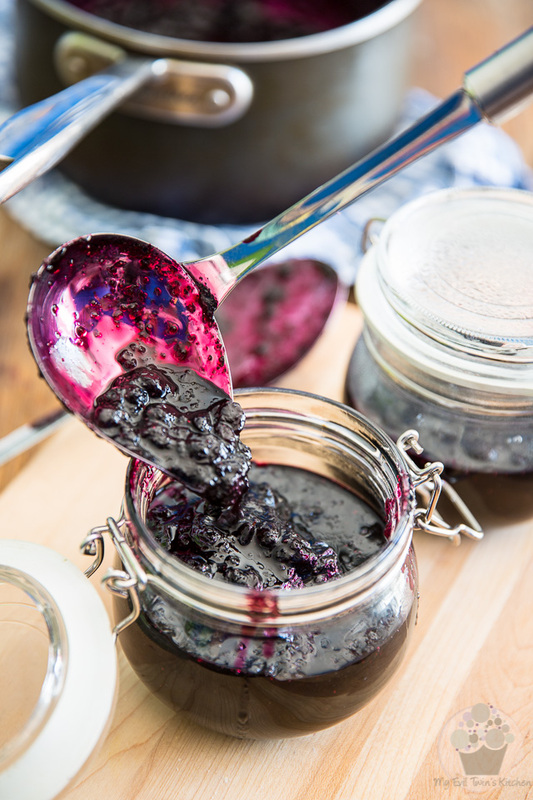 Although I haven’t tried it, I’m pretty sure that you could make this jam with frozen berries, if that’s all you had on hand, and still expect very similar results. Don’t even bother thawing the fruits: just throw them in the pan in their frozen state. Slowly bring to the boil over medium-high heat, stirring from time to time. 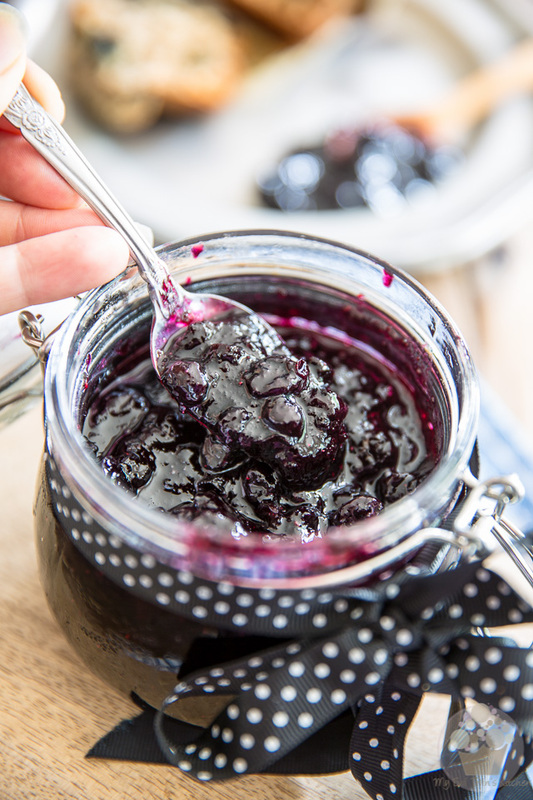 See how I used a beautiful wooden spoon to stir my jam? Bad idea! I can’t recommend that you do that, unless you’re wanting to dye your spoon some strange shade of dark blue… blueberries, they stain. BIG TIME! Stick with metal. It might not look as pretty, but it’s a much better choice for this project. 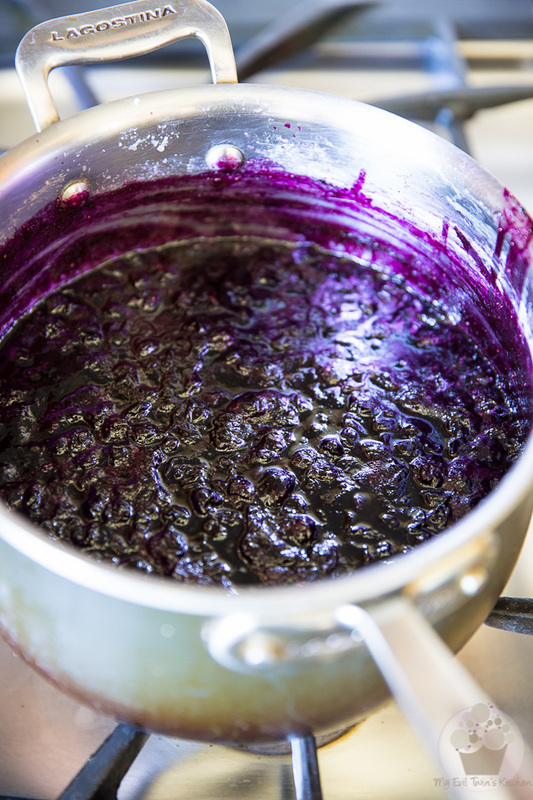 Continue to boil your jam for 25 minutes, stirring frequently and squishing/pressing the blueberries against the saucepan wall with the back of your spoon. 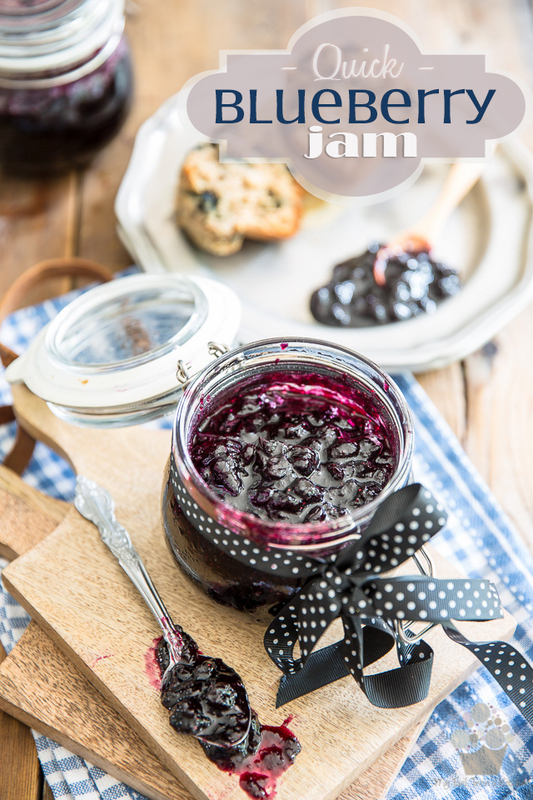 After 25 minutes, transfer your jam to sealed glass containers and then store in the refrigerator for up to a month. Like I said, I have no patience for canning and hardly see it as a necessary step when dealing with a small batch of jam. If you, however, felt safer sterilizing your jars and properly canning your jam, then by all means, feel free to do so. If you did go trough with the canning process, then your jam would keep indefinitely (or almost) and wouldn’t even need to be refrigerated. Whatever you do, however, I strongly suggest that you wait until your jam is fully chilled before you dig in. 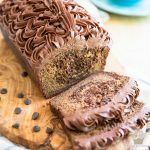 Ideally, you’ll want to give it a full day in the fridge. This will allow it to fully thicken and will also give the flavors a chance to meld and develop. Hey, notice that I said “ideally”. You do whatever you want. I promise I won’t be looking! Combine all the ingredients in a large saucepan and bring to the boil over medium-high heat, stirring from time to time. 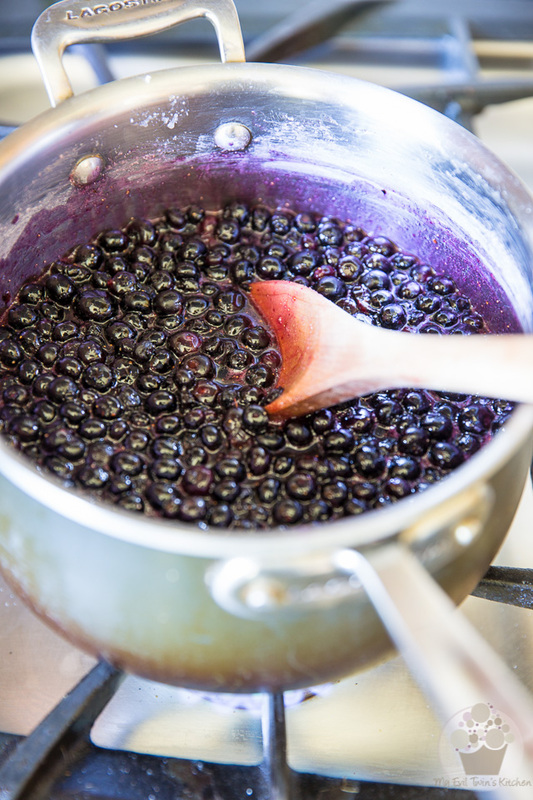 Continue to boil for 25 minutes, stirring frequently and squishing/pressing the blueberries against the saucepan wall with the back of your spoon. 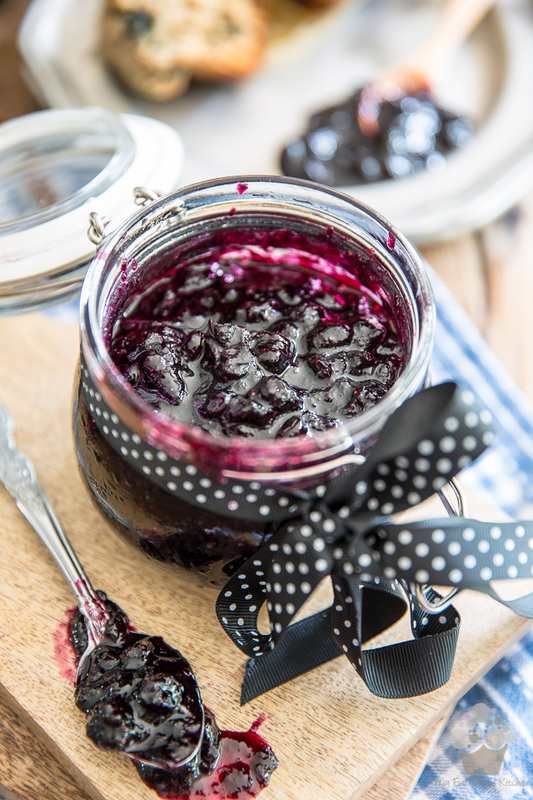 Transfer your jam into sealed glass containers and store in the refrigerator for up to a month. 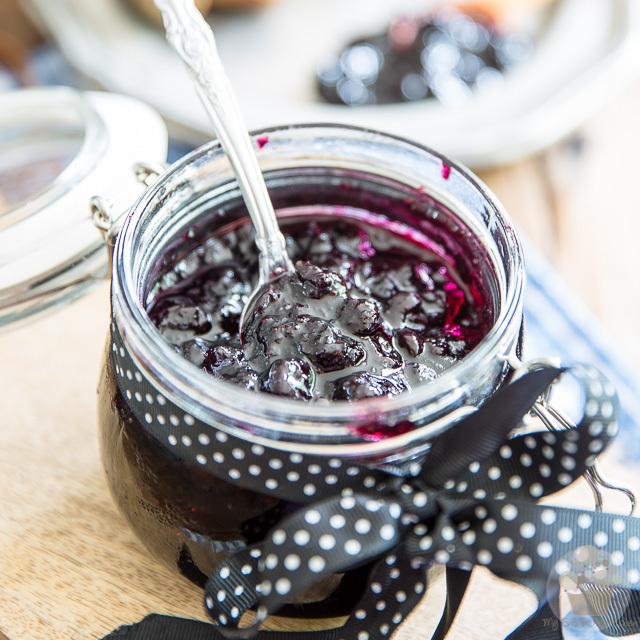 Blueberry jam with a bit of maple syrup, sounds fantastic. Growing up in Nova Scotia we always had tons of blueberries around, and blueberry jam on a scone is still a favourite treat of mine!